The Stick-It Arcade Controller I was given to review is a prototype edition. I have noted in the review where I expect your experience with a production edition of the Stick-It will differ from mine. You will find comparisons to the HotRod in this review, as I expect people thinking of buying will be shopping between the two (among others perhaps). My first impression when I picked up the package from the post office was that this was smaller than I had expected. However, when I unboxed it and sat it on my desk, it's about the same size as the HotRod. It has a slightly smaller footprint front-to-back, but is as wide. Putting it on my desk, I once again thought that I needed a bigger desk. No cracks about the mess! The console is sturdily constructed, and passed the push/prod/wiggle & bang test with flying colors. Joysticks and buttons held up not only to my playing, but also the slightly exuberant slapping and shaking of my 3-year-old. Inside the console, the wood was 3/4" and reinforced, and the wiring looked well connected. As the inside of my prototype will be different from production versions, there is no picture. Presumably, production versions will be at least as well constructed as the prototype. Two thumbs up for the physical construction. In light of problems in the past with arcade stick makers being unable to keep up with demand, many people want to know how new vendors will address this problem. Stick-It is handling the supply/demand issue by outsourcing console contruction and electronics assembly to third-party companies. (Note - previous vendors that have had problems have usually been 1 or 2 person operations that were overwhelmed). of instructions and the manual. Finally, the shipping version of the Stick-It has the sides extended an extra 1.25" so that a keyboard can fit underneath the Stick-IT for convenience. 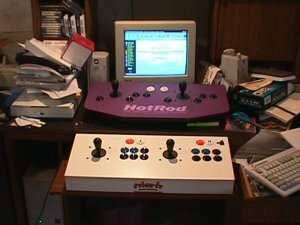 The Stick-It was literally plug and play easy to use -- Turn off computer, connect cables, turn on computer, presto! The keyboard passthrough is a two ended cable that comes with an adapter so that you can use it on PS/2 or older AT style keyboards. The Stick-It comes preconfigured from the factory with a MAME compatible key configuration. A minute after hooking it up I was playing DonkeyKong with zero brain-power required. Joystick and button placement was pleasing to the hand, and having the coin-up buttons next to the player start buttons they correspond to (coin-up player one, start player one, and coin-up player two, start player two) was a nice touch. The programming switch is conveniently located on the top right but doesn't get in the way during game play. I tested the Stick-It using MAME and a variety of different games. Because it's programmable, any game that uses the keyboard can be used with the Stick-It. I spot checked it with a couple of emulators, but did my testing in MAME. Of important note here is the fact that the joysticks in the prototype I tested are not the joysticks in the shipping production version. The joysticks in the production version are 4/8 way Supers from Happ Controls, which are excellent joysticks. Testing here should be read with that fact in mind. I tested the joystick against the same games I tested the HotRod with. I tried to test games that present problems with control normally. The first game I tried was Robotron. Control in Robotron was a dream. I was able to use both joysticks to dance around the beasties and rescue people with no trouble. Diagonals as well as up/down/left/right were easy to find and use. Gyruss was my next test. This took an extra half-hour as I had to wait my turn - my 3-year-old likes Gyruss. Rotating around the circle worked just fine. Fully playable. DonkeyKong was next on the agenda. I own a real DonkeyKong cabinet with an 8-way joystick in it, and I have problems controlling it sometimes. I'll be standing by a ladder, and attempt to go up, but the joystick will be pointed actually somewhat diagonal, and Mario doesn't move. I had the same problem with the Stick-It when I wasn't careful with my positioning. Presumably, the Super joysticks in 4-way mode in the production version won't have this problem. Next up was my favorite game when growing up - an obscure game called JumpBug. It's a fairly straightforward game where you're a VW-bug type of car bouncing along buildings and inside pyramids, gathering items and shooting beasties. To jump, however, involved a subtle up and down motion on the joystick at the right time as you bounced - you could control whether it was a small or big bounce by the way you tapped the stick. On the keyboard, I found this difficult to do and gave up playing the game. The HotRod (which uses the Happ Super joysticks by the way) did very well in my JumpBug test. The Stick-It rated highly playable, but did not respond as well as I would like. I had some problems with the fine positioning required for controlling where and how high you bounce. Again, I suspect the 4/8 way Supers will make the difference. I had the same results with the Stick-It as I did with the HotRod on the spinner and diagonally oriented games. The Stick-It performed as well as a joystick control could on a spinner-based game like Tempest. Very difficult to play on a keyboard, I found Tempest playable with the Stick-It. It is still no substitute for a spinner. Qbert was playable, but difficult. Keyboard, HotRod, or Stick-It, all three played about the same on Tempest and Qbert. Joust was another one of those games requiring a good touch on the controls to position yourself right and avoid a faceful of lance. My wife was the Joust nut, so she and I played head-to-head. Her conclusion? Just like the real arcade :) She knocked my socks off too! Finally, JungleKing. JungleKing was another favorite growing up, and was fairly easy to control except for the water level. In the water level, if you didn't position yourself just right, you got eaten by the crocs as you tried to knife them. The Stick-It passed this test with flying colors. There are a couple of things potential buyers should be aware of. One snag, not really a problem per se but rather a configuration issue, is the Alt-Space problem. As default-programmed, one button on the Stick-It generates the ALT key - another generates the SPACE key. In Windows, in a DOS prompt, ALT-Space brings up the taskbar and GUI, interupting whatever you may be doing. This, of course, caused havoc in gameplay when I hit both keys at once. This is not unique to Stick-It, and is not a problem, as within the properties for any DOS prompt or DOS based game, you can tell it not to respond to the Windows key-combinations such as the ALT-Space. While programming was easy and worked great, I had some problems getting MAME to recognize a 3-keystroke sequence I programmed to one button. Putting a pause in between the keystrokes helped, but it didn't work as I'd hoped. The fault for that appears to lie in MAME, and not the Stick-It however. Using my testing utilities, it was obvious the 3-key sequence was being sent by Stick-It properly. I did not spend a lot of time playing with or troubleshooting this feature. If this is important to you, you should investigate the capabilities of your software to handle rapidly generated keystrokes. There was no evidence of ghosting or key masking during game play. I only discovered ghosting and key masking issues when I loaded a test utility (ghostkey) and went looking for them. Ghosting is not necessarily a problem, as can be concluded by the fact that it did not cause me problems during game play. Ghosting is only a problem if the phantom keypress generated interferes with gameplay. In all the games I played, including two-player Joust, ghosting/masking never reared it's ugly head. Your milage may vary. The ghosting/keymasking problems appear to be physically related, not logically. In other words, it did not matter what keystroke a button was programmed to, the same physical combination of button/joystick presses produced the same physical ghost key. The actual phantom keystroke generated depended on the programming of the button that was being ghosted. Example: buttons A,S sit above W,E. Pressing W,E and S produced the A keystroke as well. If I reprogrammed the A to a Q, then Q was the ghosted keystroke. I was also able to generate keymasking. If I pressed the upper and lower leftmost buttons on player one, then the bottom-middle button of player one, I was unable to get the upper middle button of player one to register. It should be noted again that the ghosting affect wasn't noticed at all in the games I tested in, and Stick-It indicated that so far they have not received any complaints. For those of you who listened to MonroeWorld's Retro-Radio review, I can report that the electronics glitch they had with the prototype model did not surface at all in my play-testing -- before it was sent to me, new electronics were fitted inside and the problem resolved. Game play was fun with the Stick-It and programming was flexible and a breeze. Anyone getting their hands on one will be glad they did. 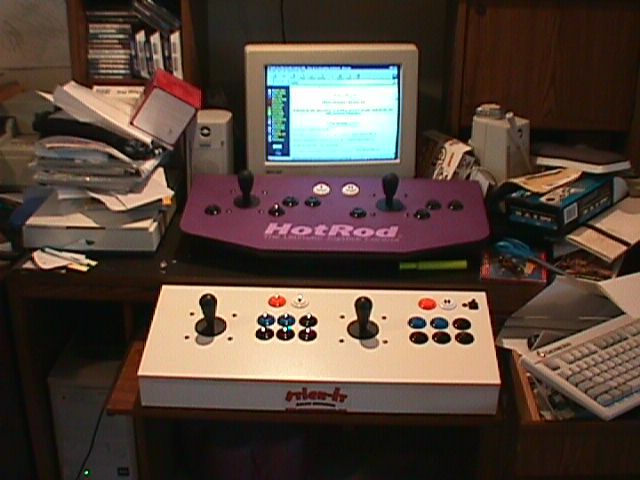 Head-to-head, the Stick-It is a somewhat less polished product than the comparable HotRod model, but is $50 cheaper and programmable where the HotRod is not. Bear in mind however that the additional $50 for the HotRod buys you copies and legal licenses for several CapCom games.